The semi-finals are complete! THE SUMMONERS edged out Fish Hookers by a mere 49 points, and Grumpy Old Men defeated The Adventurers. 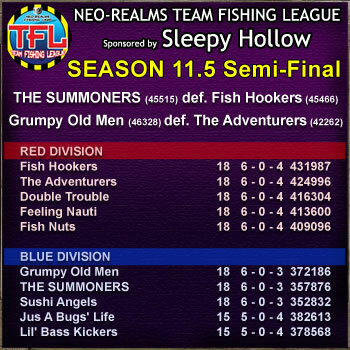 The finals this week are between THE SUMMONERS and Grumpy Old Men. Good luck! 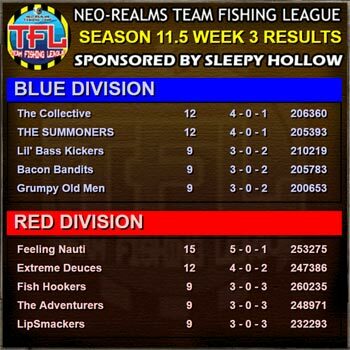 Season 11.5 Week 5 Results! Good luck to all 4 teams participating this week! Season 11.5 Week 4 Results! Only one week left to go before playoffs! Things are getting interesting in Blue Division with The Collective, Grumpy Old Men and Sushi Angels all tied for first with 2 teams only one game behind. In Red Division we have Fish Hookers, Feeling Nauti and Extreme Deuces all tied for first with 4 teams only a game behind! Good luck to all teams this week! Season 11.5 Week 3 Results! We're already over halfway done with the mini-season! In Blue Division The Collective maintain their top stop with THE SUMMONERS close behind, and in Red Division Feeling Nauti and Extreme Deuces have the 1st and 2nd places to themselves. Good luck to all teams this week! Season 11.5 Week 2 Results! Week 2 is done, and The Collective has a 1 game lead in Blue Division, and Feeling Nauti has the lead in Red Division!